(CNN) -- One week, three airline crashes. In Ukraine, the shootdown of Malaysia Airlines Flight 17 on July 17 killed all 298 aboard. Wednesday's crash of TransAsia Airways Flight 222 killed 48 in Taiwan, and on Thursday, Air Algerie Flight 5017 crashed in Mali, leaving at least 116 dead. Then there's the unexplained loss of Malaysia Airlines Flight 370, with 239 aboard, in March. Different circumstances surround the crashes, but when more than 700 airline passengers and flight crew lose their lives in the span of 138 days, some travelers might be concerned about the global aviation safety net. They may wonder if, statistically, the skies are getting more dangerous. They may ask themselves whether 2014 is trending toward one of the deadliest years in aviation history. Experts say no, don't be nervous. Just look carefully at the big picture. The world has been enjoying the safest-ever overall period in aviation history, according to the aviation safety number crunchers. 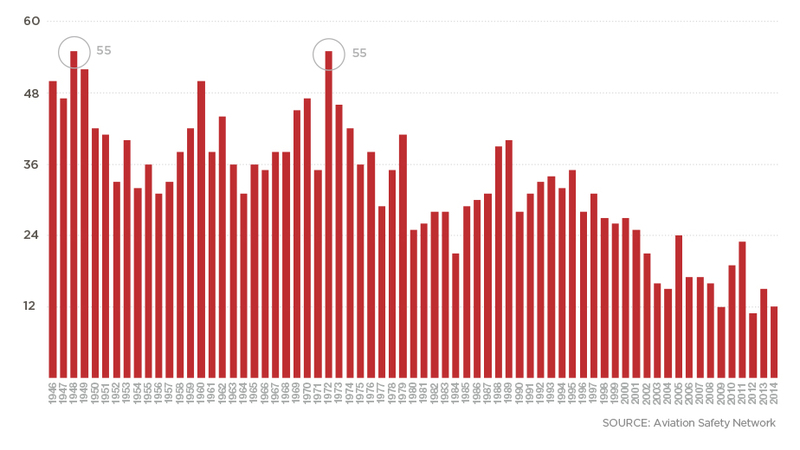 As shown in the chart above, the numbers of yearly aviation deaths and major plane crashes worldwide have been dropping for decades. 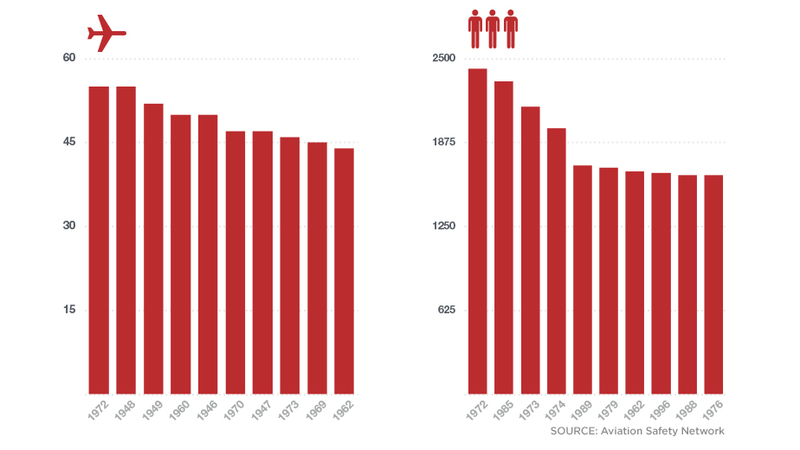 Last year, 265 people were killed in flight incidents -- the safest year in aviation since 1945. 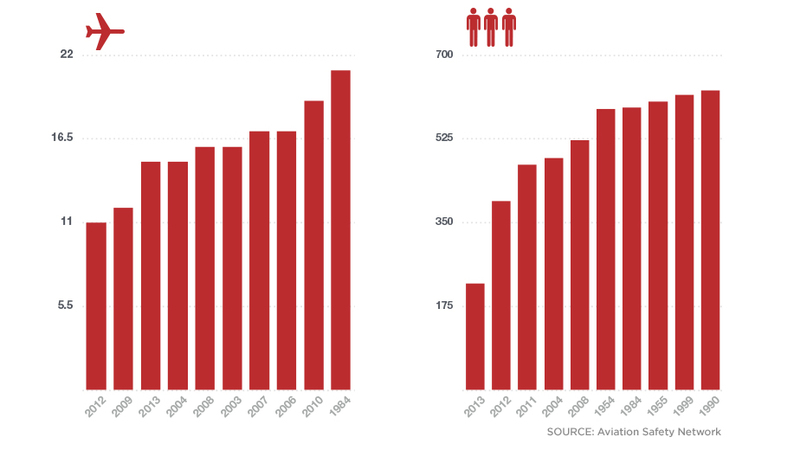 This year, the worldwide number of aviation deaths has more than doubled, but it's still relatively low. There have been 761 deaths in 12 commercial aviation accidents in 2014, according to the Aviation Safety Network, one of several organizations that tracks these statistics. 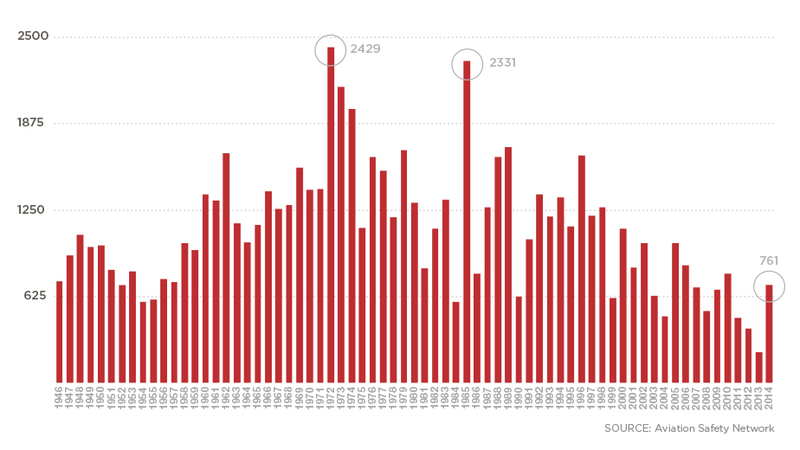 Its data — spanning 1946 to the present — include hijackings, sabotage and shootdowns. The U.S. hasn't seen a large airliner crash with major loss of life since 2001, when American Airlines Flight 587 slammed into the Queens neighborhood of Belle Harbor, New York, killing 265. More recently, 49 died in 2006 in the takeoff crash of a regional jet: Comair Flight 5191 in Lexington, Kentucky. In Buffalo, New York, 50 died in another regional plane crash, Colgan Air Flight 3407, in 2009. Last year's crash landing in San Francisco of Asiana Airlines Flight 214 — a Boeing 777 — resulted in three deaths. Clearly, the bigger the airplane, the more lives can be lost. In 1972, the worst year on record, there were 55 crashes. The Russian crash of Aeroflot Flight 217 killed 174 people, and 155 were killed in the Spanish crash of a Convair 990 Coronado. Measuring the number of crashes or deaths alone doesn't offer an accurate safety snapshot, Quevedo said. You also have to factor in the overall amount of aviation traffic. To do that, aviation industry trackers monitor total worldwide airport departures by all commercial aircraft. Then they divide the number of annual accidents by that number of departures. The result is called the aviation accident rate. Last year, the rate was 0.24 out of 1 million departures. That means less than one accident for every 1 million flights. “That number proves that the chances of being in a fatal aircraft accident are extremely rare,” Quevedo said. 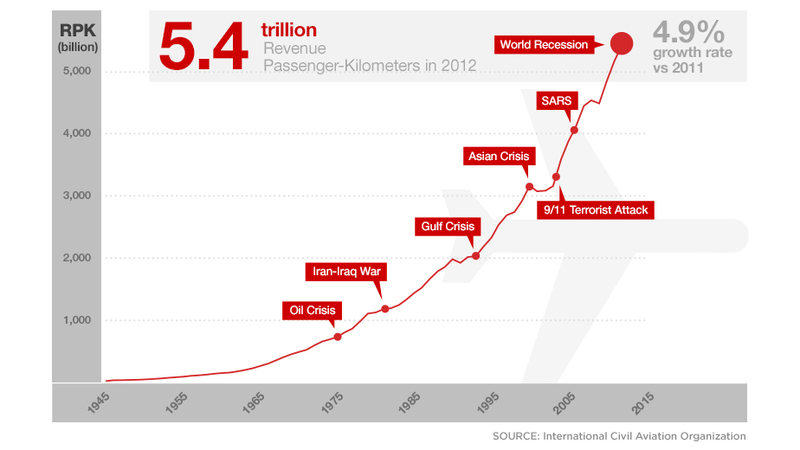 The chart above shows how passenger traffic has skyrocketed since 1946. An industry stat called revenue passenger kilometers measures the number of paying airline passengers and how far they fly. A passenger who flies one kilometer equals one RPK. In the 1940s there are so few RPKs that they barely show up on the chart. By 2012, global RPKs hit 5.4 trillion, an increase of nearly 5% over 2011. Let's get some perspective on the dramatic shift toward safety the world has seen in yearly aviation deaths. The worst crash year on record — 1972 — also had the most deaths: 2,429. Compare that with the best years on record in the graphic below. The safest years since 1946 have 11 to 21 accidents per year and 224 to 627 annual deaths. Is that the best we can expect from the global aviation safety net? Experts attribute the impressive recent safety record to improved technology, better communication and smarter procedures and management systems. Flight deck alarms alert pilots of oncoming traffic or that their planes are approaching the ground. The technology has “saved more lives than we'll ever know,” Quevedo said. It's difficult to factor in disasters like Malaysia Airlines Flight 17, Quevedo said, because so little is known about the safety-related decisions surrounding it, and obviously, commercial aircraft are not designed to fend off missile attacks. Overall, the global safety system “is quite stable,” Quevedo said, and a string of three crashes within a week doesn't indicate otherwise. CNN's Lizzie Jury contributed to this report.